While this week has been light on Skullgirls fan content, it’s been anything but light for the Reverge Labs crew. While a few of us hit the streets of San Francisco for the Game Developers Conference, a stalwart few slogged through the game’s final bugs. And remember, we’re still collecting gender-flipped fan art of our characters! Draw your favorite Skullgirl as a dude, or your favorite Skullboy as a gal and send it our way! This psychedelic, pop-art picture by Keroko is actively good, as well as interesting! Maruha returns with this excellent portrait of Valentine. NPA drew this disturbing, detailed and excellent image of Double betwist both her forms. Brian’s British friend David submitted this excellent painting of Ms. Fortune, caught in the act! OMG *0 * I totally love that last picture with Ms Fortune! Excellent Fanart Friday overall, definitely digging that last piece most for sure though. Awesome stuff.Do any of these artists have websites? All of these are amazing! I’m glad to see a picture alluding to Ms. Fortune’s story, though; not enough pics are story-based in my opinion. I must say, however, that first one kind of gives me a headache. Not because it’s bad, mind you; just… well, like you say, psychedelic. All of these are great! The one with Keroko is very interesting. Oh man I really love that last one of Ms Fortune, the amount of detail is just awesome. Plus that Double drawing is really creepy, but I suppose that Double is just creepy all the time, it’d have to take alotta work just to make Double look…okay. damn that valentine portrait is NICE!!! Helllooooo nurse! Love the Valentine pic! PARASOUL!!! & some BLACK EGRETS avatars!!! OK! now that I said that, I’ll head back to my hole & await launch day… Ciao! Going through the game’s final bugs? So, Skullgirls should be available soon!? 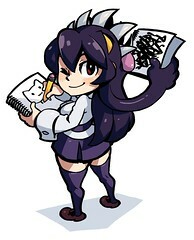 I can’t wait for Skullgirls; it’s my most anticipated game of 2012! Alongside the game’s release, I’d also like to buy some PSN avatars of the characters’ faces and/or full bodies. It’s been quiet on the RevergeLabs blog. The team must’ve been busier than usual. That Keroko illustration is just amazing. The ability to draw so many things together in such a creative way is something I envy! So, just assuming its true, we can apperently expect SG release on April 4th. Ravidrath already said on SKR that he can’t comment on this and he also said its possible the PSN release can come a day before the XBLA one. From what I have seen before, XBLA dates for downloadable games are usually reliable so it seems that SG will indeed come out April 4th. 1 more month to go! So much for a “early Q1 2012 release”. But hey! At least we have a release date now, better late then never.